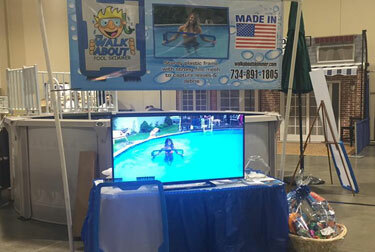 Walkabout Pool Skimmers An Innovative Pool Skimmer! You get in the pool with the Walkabout Pool Skimmer™, put the skimmer about three quarter of the way in the water (skimmer should almost float), put left hand on grip, right hand on other grip, and push around pool. Once skimmer is full of debris just shake off and if needed after you can spray with hose. Works with people of any age. 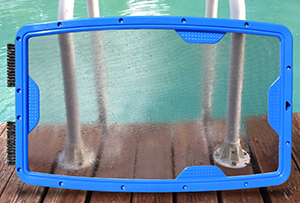 The Walkabout Pool Skimmer™ is the latest and greatest in pool cleaning. The Walkabout Pool Skimmer is a fast easy way to clean your pool. The Walkabout is 36 inches (38 inches with brushes) x 28 inches . It can be used horizontal or vertical. It also has two brushes to clean sides or bottom of the pool. It can be yours for only $49.95! The Walkabout Pool Skimmer™ is the next great swimming pool skimmer innovation. As Walkabout Pool Skimmer grows, we are always looking for new exciting and cable distributors for the Walkabout Pool Skimmer. If you would like to become a distributor, please contact us today to learn more about the Walkabout Pool Skimmer. Traditional swimming pool skimmers are unwieldy and take forever to clean pools. The Walkabout Pool Skimmer was created by Chris Greenfield to shorten the time spent cleaning above ground swimming pools. 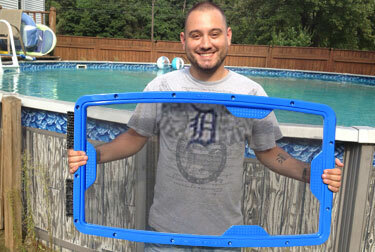 Starting off as a just a window screen, the Walkabout Pool Skimmer has come a long way…. The Walkabout Pool Skimmer is 36 inches (38 inches with brushes) x 28 inches. It can be used both horizontally or vertically and it also has two brushes to clean sides or bottom of the pool and is made right here in the U.S.A. Currently the Walkabout Pool Skimmer is available online for $49.95 and local pool supply shops and retail stores. So get your Walkabout today and see how fun and easy it is to clean your swimming pool! Traditional swimming pool skimmers cannot cover the area the Walkabout Pool Skimmer can. In half the time of a more traditional skimmer, the Walkabout Pool Skimmer can clean your whole above ground pool. With this new innovative skimmer, you will spend less time cleaning and more time enjoying your pool. The Walkabout Pool Skimmers are hands down the best skimmers on the market today. You can order yours right now for the cheap price of $49.95, so place your order and buy now!